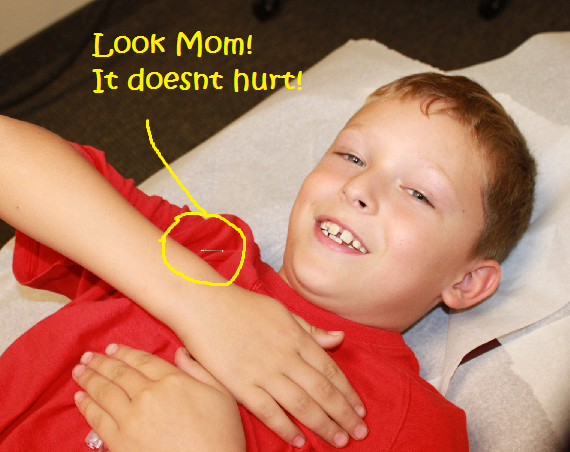 Needles are the biggest concern among parents and children. Oftentimes, when children hear “needle” they think of the last vaccination or flu shot they received conjuring up the frightening images a huge hypertrophic type needles. Acupuncture needles are hardly needles at all. With their small, thin size, they are more representative of a strand of hair. Sterilized and disposable, most people don’t even feel them being inserted into the skin. The depth of the needle is so shallow that it doesn’t even draw blood. The best way to help children overcome their fear requires time and trust. The first few visits will unlikely involve any needle at all but rather a “needle-less” buzzer which can still effectively stimulate the acupuncture points and deliver the same treatment without any needle insertions. Steering completely away from the word “needle” and calling them “little hairs” or using a non-intimidating phrase such as “planting the flags” will also ease anxiety. It’s all in the way it’s presented to the child. Dr. Steiner will often show how it’s done on himself first. Some young children may start off afraid of needles, but by the time they’re 8, 9, or 10, most of them think it’s “cool”. Man people believe that children may avoid disease altogether if introduced to acupuncture at an early age. In Asian countries, this is common practice and a good preventative measure that most children often enjoy. I am not sure where you’re getting your information, but good topic. I needs to spend some time learning much more or understanding more. Thanks for fantastic info I was looking for this info for my mission. feed and I am hoping you write again soon! I finally found a good article. Thank you! There’s certainly a great deal to know about this topic.I love all the points you’ve made. I simply want to say I’m new to blogging and definitely enjoyed your blog site. Almost certainly I’m likely to bookmark your website . You amazingly have terrific stories. Thanks a lot for sharing your website page.
! Keep up the good work ! Great article! We are linking to this great post on our site. Keep up the good writing. owners and bloggers made good content material like you did, the internet would be much more helpful. This is very satisfactorily written. The article was informational to readers who have a good worth for articles. We looking ahead for even more of the same. He has outlined each and every little thing very beautifully and briefly. Thanks for ones marvelous posting! I truly enjoyed reading it, you can be a great author.I will be sure to bookmark your blog and definitely will come back in the foreseeable future. I want to encourage you to definitely continue your great work, have a nice evening!